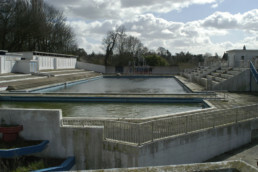 Broomhill Open Air Swimming Pool was designed by County-Borough of Ipswich engineer E McLauchlan. One of 15 listed public lidos in England, the Modern style pool building is one of the most attractive lido style open-air pools in Britain and has an unrivalled position on the edge of Broomhill Park. 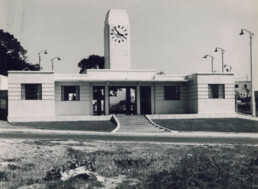 Janet Smith wrote, in her definitive book Liquid Assets: “Broomhill may lack the national profile accorded to Saltdean, Tinside or Penzance, but it is arguably their equal in architectural significance”. 55 yards x 20 yards (8 lanes wide), the competition pool is 15ft deep and holds 464,000 gallons/2.1 million litres of water. There is a children’s pool 12.5 yards x 20 yards, grandstand for 700 spectators and changing cubicles for 70 ladies and 108 men. 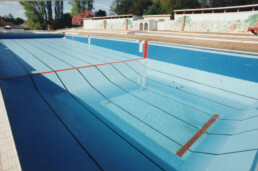 The pool has the last known Wicksteed (of Kettering) diving stage which accommodates 2, 3, 4 and 5 metre diving boards and a separate 1 metre spring board. The facility was originally furnished with flood lighting, both on the poolside and underwater. The water was filtered and heated to 70F/21C, before the boilers were requisitioned for WW2 in 1941. The 3 hour filtration rate for 2,500,000 litres of water was one of the fastest in the country. The pool closed in 2002. A friends group was immediately formed, becoming the Broomhill Pool Trust in 2003. 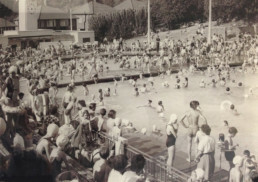 The Trust has worked tirelessly since then to lobby, explore and liaise with Ipswich Borough Council, Fusion Lifestyle and all interested parties to preserve Broomhill Pool for future generations. In 2015, Fusion Lifestyle secured Heritage Lottery Funding with a £180,000 stage 1 development grant towards a full grant of £3.3m. Ipswich Borough Council have budgeted a contribution of up to £1m, with Fusion Lifestyle investing a further £1m+. 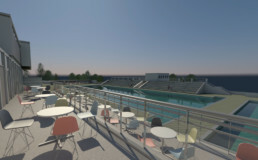 Fusion will operate the grade II listed lido once restored. Broomhill Pool is expected to be restored and reopened by Summer 2019.